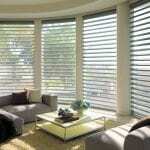 Home > Window Treatments Blog > Motorized Blinds: The Next Best Thing in Automation! The ability to program your motorized blinds. With motorized blinds, you have the ability to program your blinds to open or shut at a specific time each day. This is a great feature for when you want to add privacy in the evening but are busy cooking dinner. It’s also great for those times of day when your windows are in direct sunlight and overheating the room! Easy to use. The fact of the matter is that when things are too difficult or inconvenient for you to use, you likely won’t use it. Motorized blinds are incredibly easy to use, from the youngest to the least technologically advanced, everyone can figure out motorized blinds in no time. Act as an added layer of safety. Corded blinds are a great option for a majority of people, but if you have children or pets that climb, corded blinds can pose a safety hazard. For more information about motorized blinds and how to use them in your home or office, come see us at Ashtons Blinds today.